I was visiting my parents last week for Christmas in Knoxville, TN when I first heard about the coal ash spill at the Kingston Fossil Plant. My dad and I drove 35 miles from his home in Knoxville to the site of the devastation in Kingston. My dad knows all of the backroads around Harriman and Kingston so we were able to get close to the spill despite the police roadblocks. The roads were filled with large trucks carrying gravel to the site and hauling away god knows what! I was completely horrified as we drove through several nice neighborhoods that were directly across the river from the plant. 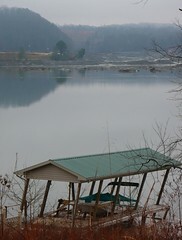 Large waves of ash filled water washed up behind these homes destroying boat docks and spreading the toxic sludge. According to the New York Times the plant produced 45000 pounds of arsenic, 49000 pounds of lead, and 713 ounds of mercury in 2007 alone. Now decades worth of this arsenic and lead have been dumped into the Clinch and Emory rivers polluting the drinking water for over a half a million residents downstream. United Mountain Defense has published a copy of the initial TVA water test results and the results are awful.